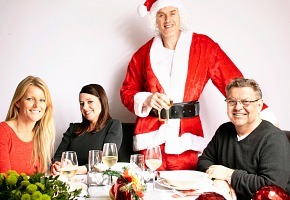 LifeStyle kicks off a new season of Celebrity Come Dine With Me Australia with a Christmas special next month, ahead of a full season in January. It has also upped the celebrity stakes with diverse names including Lisa Curry, Matthew Mitcham, Maria Venuti, Carlotta, Luke Jacobz, Myf Warhurst, Gretel Killeen, Steve Price, Red Symons and Mark Holden. Foxtel’s The LifeStyle Channel today announced the commissioning of a fifth season of the popular reality and foodie series Come Dine With Me Australia. And this time, following the success of last year’s one-off celebrity special, our favourite Aussie celebrities will be opening their doors and inviting us into their kitchens all season. Celebrity Come Dine With Me Australia sees some of the nation’s most celebrated and notorious Australian celebrities come together to battle it out for the title of the ultimate dinner party host. The celebrity contestants are sporting legends, AFL star Anthony ‘Kouta’ Koutoufides, former-Olympian Lisa Curry, Brisbane Bronco’s captain Sam Thaiday, Olympic diver Matthew Mitcham and fitness guru Tiffany Hall; iconic fashion designer Peter Morrissey; landscape designer Charlie Albone; outrageous comedians and glamorous showgirls Maria Venuti and Carlotta; broadcasters and TV presenters Luke Jacobz, Sophie Falkiner, Myf Warhurst, Gretel Killeen and Steve Price; musicians, and stars of stage and screen James Morrison, Christie Whelan Browne, Red Symons and Mark Holden; and glamour girls Simone Callahan and Kate Waterhouse. Each believes they can serve up the best dinner party and hopes their unique style will clinch them the title of best host and $2000 for their chosen charity. Television and radio presenter James Valentine is back on board as narrator for the fifth season, overseeing each episode with witty observations and unique commentary. This made for Foxtel, local production of the hot international format, is produced by ITV Studios Australia exclusively for The LifeStyle Channel. Celebrity Christmas Come Dine With Me Australia will air on Sunday, December 1 at 8.30pm and the rest of the series kicks off on January 7, Tuesdays at 8.30pm.